We make every attempt to keep our links up-to-date and we check them weekly with LinkAlarm. If you notice errors or bad links, or have suggestions for listings we might add, please contact us. Cuba is an island at the entrance to the Gulf of Mexico between the Caribbean Sea and the North Atlantic Ocean, 150 km south of Key West, Florida. Its nearest neighbors are Haiti (77 kilometers to the east), the Yucatan Peninsula (210 kilometers to the west), the Florida Peninsula (180 kilometers to the north), and Jamaica (140 kilometers to the south). 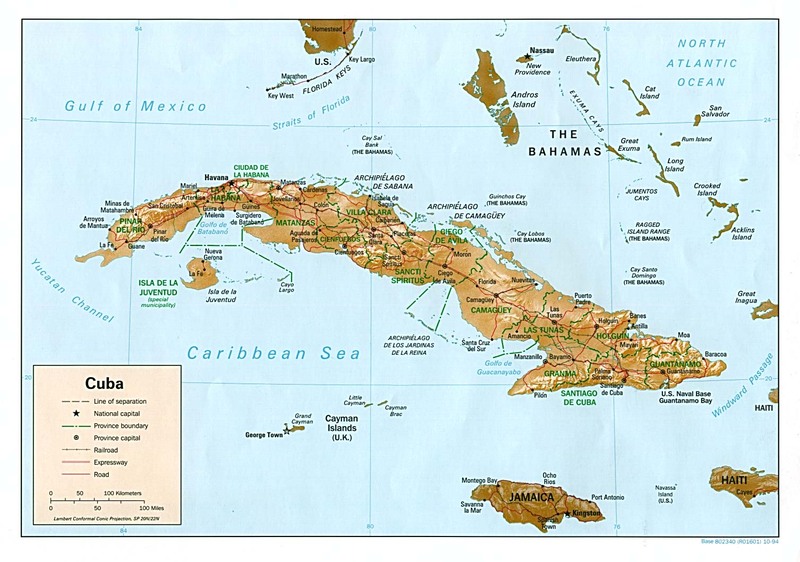 Cuba is by far the largest island in the Caribbean. It has a total land area of 110,860 square kilometers with 3,735 kilometers of coastline, and is slightly smaller than the state of Pennsylvania. The terrain is mostly flat to rolling plains, with rugged hills and mountains in the southeast. Altitudes range from sea level to 2,005 meters. The longest river is the Cauto, 250 kilometers. The United States leases a naval base at Guanatanamo Bay in the southeast corner of the island. The lease to this land was given by the Cuban government in 1903, a government installed by the United States. The lease continues until both Cuba and the U.S. mutually consent to terminate it. "200 million children in the world are sleeping in the streets today. None of them are Cuban." The aboriginal race was exterminated by the labor policies of Spanish landlowners, who then brought in thousands of Africans and Chinese to work in the sugar industry. Later Europeans from Germany and France came to Cuba, as did peoples from other areas of the Caribbean including Haiti and Jamaica. The current Cuban population is a mixture of these many races and cultures. Cuba is a secular country with freedom of religion. Although Roman Catholic and Afro-Cuban (Santeria) religions prevail, other religions are practiced as well. Spanish is the official language in Cuba and there are no dialects. English is the language used for commercial operations. To place a call to Cuba, dial 53, the city code, and the number you wish to call. To place a telephone call to any country of the world from Cuba, dial 119, then the country code, and then the area code followed by the desired number. To place a direct telephone call within Cuba, but outside of the city where you are located, dial 0, the code of the city you are calling, and the desired number. Cuba has a subtropical climate with temperatures averaging 77 ° Fahrenheit. Summers can reach 90° or higher. During the coolest period of winter, temperatures can drop to 50° Fahrenheit. The northeastern trade winds provide most parts of Cuba with a gentle breeze throughout the year. Cuba's dry season runs from November through April, and its rainy season from May through October. Humidity averages 78%; higher in the summer. Cuba can experience hurricanes anytime from August through October, and occasionally in other months as well. The country averages about one hurricane every other year. Cuba's weather is very similar to that of Miami, Florida. All visitors to Cuba must carry a valid passport for at least six months. Those traveling as tourists must also have a tourist card. Tourist cards can be purchased at Cuban consulates, and travel agencies or airlines authorized to do so. Visas and tourist cards are valid for 30 days from the day you arrive in Cuba, with the possibility of renewal for another 30 days. Visitors traveling to Cuba on business, studies, as journalists or for work, as well as for long stays, must apply for an entry visa at the Embassy or Consular Office of Cuba in their country of residence. Citizens born in Cuba, who are not currently residing in the country, must apply for an Entry Permit (Permiso de Entrada) at the Embassy or Consular Office of Cuba in their country of residence. This request will be processed by the Immigration Department of Cuba. 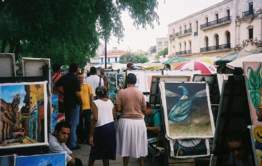 Residents in the United States (not born in Cuba) must apply for a tourist card at Cuba's Interest Section in Washington or at a travel agency that has purchased the card from the Interest Section. For further information on visa procedures, visit the web site of the Cuban Interests Section in the United States. The laws of the United States of America prohibit any of its citizens from traveling to Cuba. Therefore, U.S. citizens must apply for a license from the Treasury and State departments. For further information, see U.S. Treasury Office of Foreign Assets Control. Cuba has a mandatory $25 USD airport tax, payable at the airport when you leave Cuba. There are no restrictions on luggage weight; only on the kind of goods brought in. Therefore, Customs Authorities have regulated that visitors can import, apart from their personal belongings, new or used articles up to a value of $250.00 USD. Articles exceeding that limit are subject to seizure. Out of the limit of $250 (two hundred and fifty dollars) in value authorized for importation, the first $50.00 (fifty dollars) are exempt of payment, so the maximum tax to pay will be $200.00 (two hundred dollars). A video camera is allowed but video and DVD players are banned. It is strongly prohibited to import explosive substances, firearms and pornographic material. Clothing should be light, mainly during summer, so it is best to wear shorts, cotton and flannel outfits and sandals. In winter, a light jacket or a fine wool sweater and closed comfortable shoes are suitable, mainly at night. Also, bring sunglasses, a bathing-suit and sunscreen. Urban transportation such as the "camel" is always crowded and unreliable. It is easier to take taxis or tourist buses instead, or walk when it's a short distance. For a tour of the island, your best option is to rent a car. There are car rental offices at the airports, hotels and tourist spots. You must show your passport and driver's license in order to rent a car. The driver must be at least 21 years old; the license can be international or from your country but it must be at least one year old. It is not advisable to drive at night. You must also watch out for animals on the road and cyclists in urban areas when you are driving. Park the car in a safe well-lit place and do not leave valuables in it. You are liable for traffic fines. Failure to pay can mean a debt with the State. It is recommended that you buy a "Road Guide of Cuba" which is very helpful for finding your way on Cuba's roads. Education is free and obligatory until the ninth grade. In the 1961 nationwide "Literacy Campaign", illiteracy was eradicated and today the population has a high level of education. Cuba's national system of education ranges from day care centers for working mothers' children to universities located throughout the country. The national currency is the Cuban Peso (CUP), which is equivalent to 100 centavos (cents). Notes can be of 1, 3, 5, 10, 20, 50 and 100 pesos. Coins can be of 1, 5 and 20 centavos, and there are others of 1 and 3 pesos. Credit cards—except those issued by US banks or their branches in other countries—are accepted. Among those accepted are MasterCard, Visa International, CABAL and BFI. Traveler's checks, including those issued by US banks, are accepted. Cuban convertible pesos and coins equivalent to 50, 25, 10, 5 and 1 cents have unlimited legal exchange use in Cuba. Cuban convertible pesos can be changed upon departure at bank offices at international airports and ports in Cuba. Even though Cuba has a low crime-rate, it is also good to take precautions. Do not carry more money than you need, exercise caution with your belongings and purchases; take good care of your wallet and passport in crowded places; check the bill at restaurants, keep your jewels and valuables in the hotel safe; and so-called "tourist guides" who might encounter you on the street—particularly those offering "bargains" on cigars. Cuba's public health system is the finest in Latin America, and in some respects its quality exceeds that of the United States. In 1996, Cuba had one doctor for every 200 citizens, in contrast to the United States, which had one doctor for every 405 residents. A child born in Havana is twice as likely to survive as a child born in Washington, D.C. Health care is free to Cuban nationals, but tourists who require treatment will be charged nominal fees. Most hotels provide 24-hours health care services with specialists and nurses. There are specialized clinics for tourists in the main cities. Be aware that the U.S. trade embargo has made many medicines hard to come by on the island for emergency treatment. Also, since Cuba is not tolerant of drugs or drug smuggling, if you take prescription medicine, bring it packaged in the original container with full labels on the bottle. Even though no inoculations are required for travel to Cuba, it is advisable to have a check-up before you depart. If you haven't had a booster shot in a while, some of the shots you may need to bring up to date include: polio (every 5 years), typhoid (every 3 years), and tetanus/diphtheria (every 5-10 years). Either gamma globulin or Havrix vaccine for hepatitis A is also recommended. Since some shots require a time window of several months before immunity takes effect, it is good to get the shots as early as possible before you leave. Wear mosquito repellent in rural areas, preferably those that contain at least 20% DEET. Be aware that DEET is a toxic chemical; in concentrations over 90% it eats through plastic. Continued use of DEET over extended periods of time could be harmful to your health. Citronella, a natural insect repellent, does not contain any DEET. Unfortunately, it is also not as effective. Taking B-12 vitamins and garlic pills are also said to help ward off mosquitoes. DEET-containing repellents can be purchased in drugstores, hardware, backpacking or military surplus stores. Citronella can be found in health food and outdoor activity stores. The voltage in most residential and trade areas, offices and hotels is 110 V / 60 HZ, though some facilities already have 220 V / 60 HZ. Wall outlets are for flat plugs so bring an adapter if necessary for your appliances. One teaspoon of sugar, juice of half a lime, two sprigs of mint, soda water, 5cl of light rum. Dissolve the sugar in the lime juice in a tall glass, then add a little bit of soda water. Gently crush the mint in the glass. Add the rum, two or three ice cubes, then fill with soda water, stir and serve, garnished with a mint spring. 2 ounces (4 tablespoons) fresh lime juice, 1 teaspoon powdered sugar (optional), 4 loose mint leaves and 1 spring of mint, 2-3 ounces Cuban white rum (or any white Caribbean rum), 2 ounces club soda, dash of bitters. Combine the lime juice, sugar and mint leaves in a tall glass; muddle or stir well so mint leaves are just slightly crushed. Fill the glass with crushed ice; stir in the rum and top the glass with club soda. Garnish with the mint sprig and add a dash or two of bitters. Cuban cuisine is a combination of Spanish and African influences. The national dish is ajiaco, a stew of vegetables and root vegetables, preferably cooked with pork or other meat. Other popular dishes include black beans, barbecued pork, Arroz con Pollo (chicken and rice), and Moros y Cristianos (Moors and Christians - black beans and rice). Official Cuban cigar website for all brands including Cohiba, Monte Cristo, Partagás, Romeo y Julieta, H Upmann, and 27 others. Also includes a history of Cuban cigars, cultivation, production, and the annual Habano Festival in Havana. Attractions include the cities of Havana and Santiago de Cuba, Viñales Valley in Pinar del Río Province, the Che Guevara Monument in the city of Santa Clara, beach resorts like Varadero, and the colonial town of Trinidad. In the city of Havana, they include Old Havana (Habana Vieja), Plaza de Armas, Plaza de la Catedral, the Malecón, Parque John Lennon, Parque Central, the Capitolio, and numerous restaurants, cafes and night clubs, art galleries and museums. 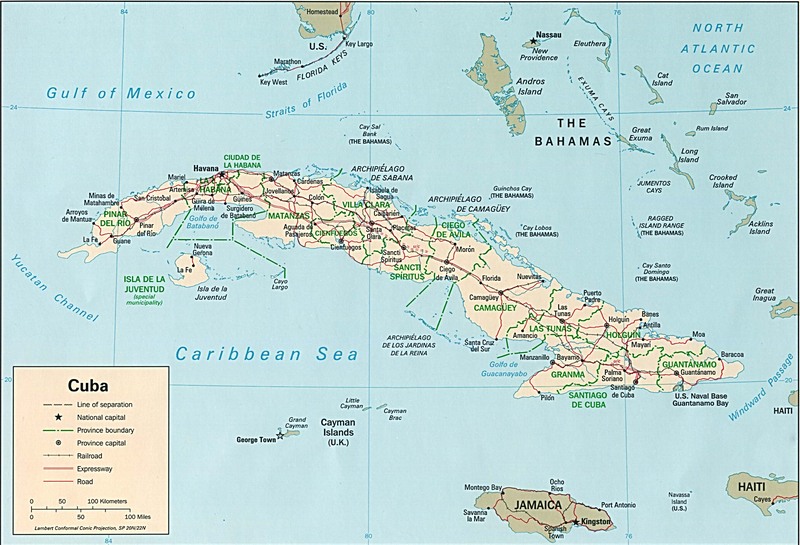 Cuba is divided into 14 provinces and 169 municipalities. From west to east the provinces are Pinar del Río, Havana, City of Havana, Matanzas, Villa Clara, Cienfuegos, Sancti Spiritus, Ciego de Avila, Camgüey, Las Tunas, Holguín, Granma, Santiago de Cuba, and Guantánamo. The special municipality known as the Isle of Youth (Isla de la Juventud) is located off the southwest coast. 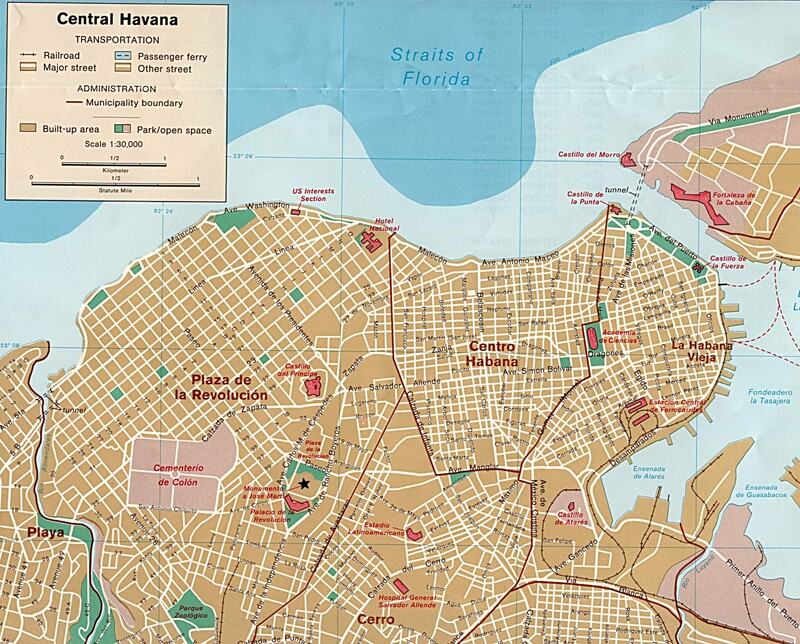 Used by city of Havana for planning purposes. Tours for visitors. 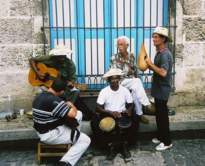 For those who share an interest in Cuban food, history, culture and customs. Now with weekly flights direct from Los Angeles to Havana. If Papa could do it, you can do it too. To rent a car in Cuba, the driver must be at least 21 years old and have an international driver's license or that of his country of origin, with no less than one year of experience. There is an additional charge of $5.00 USD if the driver is under 25. At the time of rental, the driver must carry his/her passport and driver's license. Cars can be rented through Vacacionar Travel or Cuba Linda.